The Huawei Honor is made in China and proudly so. Designed, engineered and created in the Land of the Dragon, it's nothing like your run-of-the-mill cheap knock-off. It's a genuine Chinese product, not just something put together for someone else – including premium brands drawn by the low manufacturing costs. The Huawei Honor is a Chinese smartphone – and one with solid specs too. Not as loaded as the Meizu MX, but a lot more subtle too in doing an impression of some of its illustrious contemporaries. Anyway, most phones in the Huawei lineup looks like a phone you've seen. This is not a trivia quiz though. And we don’t care what phone (or phones) the Huawei Honor brings to mind. There must be more important things to Huawei than coming up with fresh original designs. How much bigger, you ask? Well, how about - pretty huge. 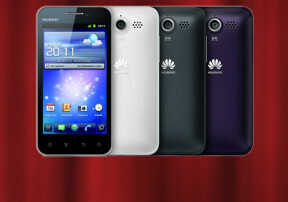 A multibillion multinational, Huawei is - to put it simply - the Chinese version of Motorola or Ericsson. One of the world’s leading network and telecom equipment manufacturers, they've been making mobile phones too for a while now. Ideos should ring a bell: a small lineup of low-to-mid-tier Android smartphones and tablets. The Honor is the next step for them. It’s pretty much the company’s current flagship. A 1.4GHz-powered Gingerbread-running smartphone with a rather interesting custom skin. The 4” FWVGA screen and the 8 megapixel camera are the other prominent features on the list. Droids come in all shapes and sizes, feature sets and price tags. You’ve heard it all about Samsung’s droids, or Sony Ericsson’s, or HTC’s. And think that’s all there’s to know about Android. Well, apparently Huawei can show a few tricks too. We're not quite sure about the first impression the Huawei U8860 Honor leaves. You'd do well though not to let it fool you. Plain design and more cheap gloss than we're comfortable with - most people will find it hard to believe they're dealing with a rather impressively spec'd handset. It’s an easy one to miss but anyone looking for a reasonably priced Android cameraphone should pay attention. It’s time to see if the Honor can do the job and make at least some difference in a crowd filled with class “A” contenders. The Huawei Honor isn’t trying to impress or scare the Galaxy Nexus or the iPhone 4S. It’s a fight they will win even with one hand tied behind their back. It’s users Huawei need to convince and if the Honor turns out credible, they’d be one step closer to their goal. How to add lyrics into the music player? Can you please give me the tutorial? is normal cell phone battery overheats. The cell phone I bought yesterday. Is there a way to fix it?